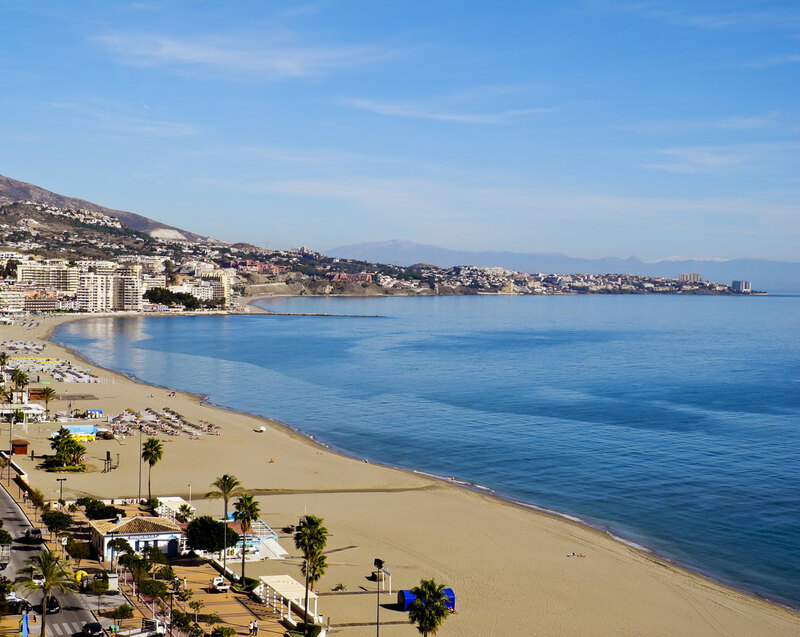 On this page you will find the most interesting sightseeings of Fuengirola. The most famous landmark of Fuengirola is the Castillo Sohail. This castle is strategically located on a higher part of the city. It was built in the tenth century by the Moors and served to defend the estuary. Due to its favorable location it is also used in Roman times. Since the loss of his military function, the castle has been seriously neglected. It has been thoroughly renovated since the 1980s. 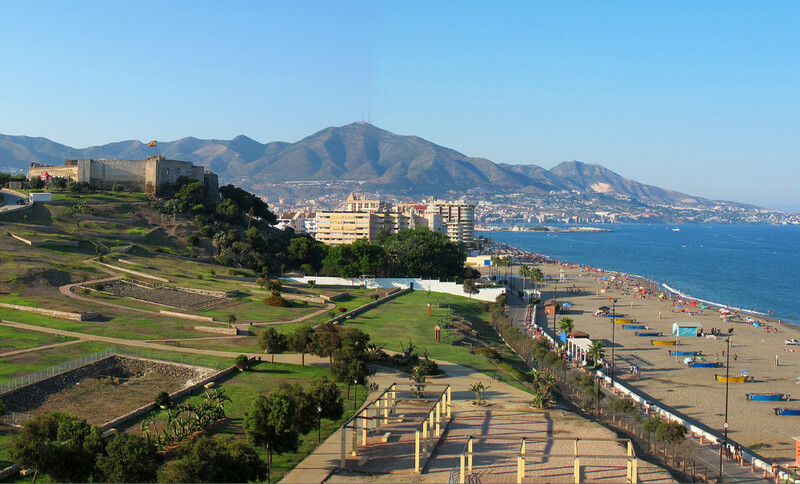 Nowadays it is a tourist attraction with five exhibition rooms and stunning views over the sea and Fuengirola. Entrance is free. In addition, the castle is a place for locals to relive the history of the city. During the summer, many events and festivals are organized on the hillside. This is Fuengirola’s most famous square. There are very cozy restaurants and cafés to be found. It’s also super busy in the summer. Especially in the evening you must have been here once. When the sun is underneath, there is a cozy atmosphere thanks to the intimate lighting. Usually there is live music. In the middle of the square is a beautiful old church: Parroquia de Nuestra Señora del Rosario. It is the main church of Fuengirola. It is well maintained and has a very elegant interior. Weddings and baptisms are often organized. Opposite the church is a beautiful fountain. This fountain describes Article 2 of the Spanish Constitution, which has been in force since 1978. The square is named after the new Spanish monarchy. The station and the beach are a 5-minute walk away. Below the square is a parking garage. Near the Castillo Sohail, this beautiful bridge is built. Although the bridge is officially intended for pedestrians, it is also eagerly used by cyclists. It is about Río de Fuengirola, connecting the beach of El Ejido with Santa Amalia. The bridge can be seen as the Erasmus in the small. The connection is widely used to get from the center to the castle, which can be seen from here. The Miramar shopping center can also be reached on foot by means of the bridge. Cross the bridge towards the castle, turn right and walk a few hundred meters down the river. In the dark the bridge gives light, which gives beautiful pictures with the castle in the background. It’s a short photo stop more than worth it. Plaza San Rafael is a square in the Los Boliches district. 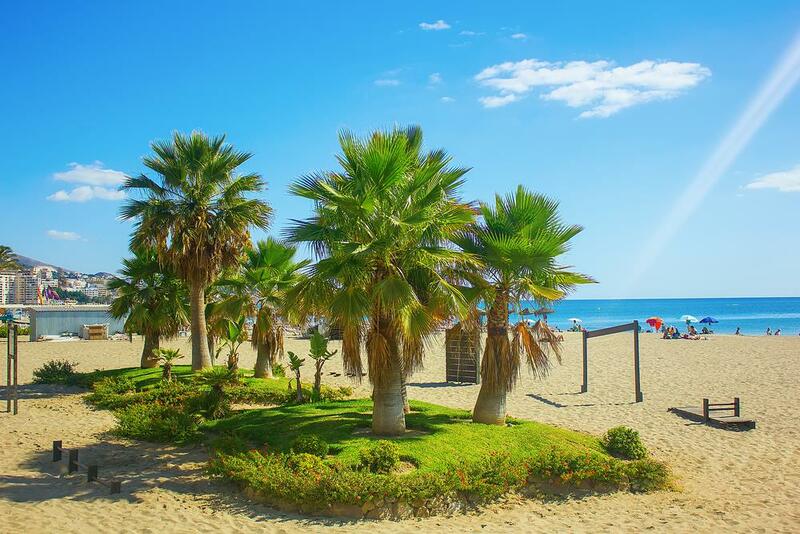 It is adjacent to the seafront and is one of the more cozy areas of Fuengirola. This is due to the mix of restaurants and shops. But also because of the large influx of tourists who easily find this part of the city. In the middle of the square is the monument of Angel San Rafael. The sculpture of the archangel is surrounded by a landscaped fountain. In the same square, on the seafront, there is also a Roman monument and a tribute to athlete José Millan Jimenez, born in Los Boliches. A small playground has been built and shaded places have been created thanks to the large trees. On warm days it is nice to stay on the benches. The only hotel that borders Plaza San Rafael is the beautiful Ilunion Hotel (4 stars). Rooms have sea or square views. The beach is at your doorstep! Next to this hotel is Restaurante Plankstek. The outside is very misleading. The quality does not radiate, but nothing is less true. The staff is friendly and professional and the food is delicious! At the back of the square is a street with more shops and eateries, such as the Dutch grand café Santé. Los Boliches Station is around the corner, so the accessibility is so excellent. From here, trains leave for Malaga (Airport). 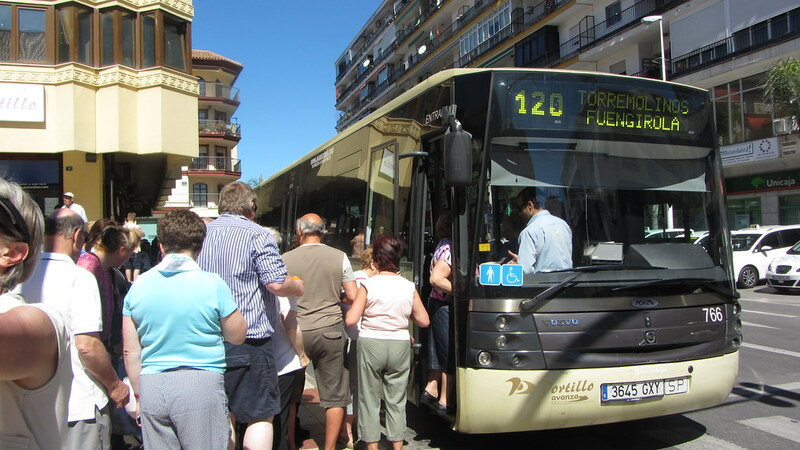 There are also buses to Torremolinos from this station. The Peseta monument is on the seafront of Los Boliches near Hotel Yaramar (4 stars). The Peseta was the official currency of Spain and Andorra from October 19, 1868 until January 1, 2002, when the euro was introduced. For the time being, the Spaniards exchanged 166,386 pesetas for 1 Euro. From March 1, 2002, only Euros could be paid. The monument was designed in 2007 by José Gómez Guerrero, designer of several monuments in Fuengirola, such as the Seat 600. He provided Fuengirola the first monument to commemorate the old currency. Later, several cities followed, mainly in southern Spain. For those interested there is a sign with a detailed description next to the monument. In the north of Fuengirola lies Finca del Secretario. Here are excavations to be seen from Roman times. The discovery of the archaeological site was done in the period 1970 to 1988, during the construction of the C-1 railway line (Fuengirola – Malaga). Among other things, there is a salt factory. Here in the past Garum was made, in Roman times a popular sauce. The factories were on the southern coast of Spain due to the presence of large quantities of tuna and mackerel, fish used to make the sauce. In addition, thermal baths and a pottery factory are excavated. The Venus of Fuengirola, seen in the Historical Museum, is also found here. The excavations are provided with information boards. The park is free to enter for all visitors. However, dogs are prohibited. A new cafe is open at the entrance. Los Boliches Train Station is a 5-minute walk away. On July 8, 1962, Fuengirola opened this third-party bull racing arena. The arena is located south of the center and borders the Bioparc. It has undergone a number of renovations, the latter being in 2012. Although Spanish tradition has become increasingly controversial, bullfights and horse shows have been held since then. Most events mainly take place during the summer and during the Feria de Rosaria (6th to 12th of October). The arena has a capacity of 4,500 spectators. Tickets are available here. Plaza del Ayuntamiento is Fuengirola’s former town hall square. The square has been thoroughly overhauled in 2014, so it has become much more accessible. During the renovation, a new monument was revealed: Monument to the Catholic Monarchs. It is a tribute to the Catholic princes as well as the celebration of Catholicism. On the square there are a number of cozy terraces for a cup of coffee. It is therefore a pleasing alternative to the (tourist) boulevard. Plaza del Ayuntamiento has a taxi rank and a 5-minute walk can be found at both the beach and the train station. Since the renovation, the square is an excellent hotel richer. Casa Consistorial even gets an average of 9 as a rating! Do not have too much expectations from the port of Fuengirola, there are no boats like these in Monaco. It is therefore the ninth place of sights. Although there are mostly hobby boats, it is always nice to walk through a harbor. It is often busy and there are a number of restaurants to be found. In addition, many water sports are organized from the port. Also, take the ferry to Benalmádena and the dolphin excursion. Tickets are available through Port Ticket Office. At this place there are also the SouldPark (fairground) and the train that runs along Fuengirola’s sights. For mere beautiful boats, Monaco or neighboring Marbella (Puerto José Banús) is a better option, but for a nice excursion or activity on the water, Fuengirola Port is a top spot! The Mezquita de Fuengirola is the only mosque of the city. It is located at the roundabout onto Av. Miramar and the Av. Connect Santa Amalia. On this roundabout is also the Rosa de los Vientos (wind rose), a sculpture of 8 pieces of stainless steel, corresponding to the cardinal points on a compass. The Islamic Cultural Center was built in consultation with local politicians. They saw the need for a place where Muslims could retain their identity. In addition, integration into society and the construction of a bridge between Islam and Christianity are the other goals of the mosque. The building was officially opened in October 1993 and is accessible to both Muslims and non-Muslims. Shoes should be pulled out at the entrance. The mosque is very famous in the wide area, it has half a million (!) Likes on Facebook. Museo de la Ciudad is the Municipal Museum of Fuengirola. It has a great downtown location near the town hall. The cultural center was opened on February 14, 2003. There are several rooms of former residents of Fuengirola, such as the Visigoths, Moors, Romans and Carthagers. In addition, there is a room devoted to the 70’s tourism. Among the interesting exhibitions is also a well-structured video about the phases of the history of Castillo Sohail. One of the most important attractions of the museum is the ‘Venus de Fuengirola’, excavated in the Finca del Secretario. The history of fishing in Fuengirola and Los Boliches could of course not be lacking in this musuem. It is daily to visit between 10:00 – 13:00 and 17:00 – 20:00. On the Calle Emancipación, side street of Plaza de la Constitución, is the ‘Salon Variets Theater’. This charming theater with 296 seats was built in 1925. It served as a Spanish theater and then as a cinema. Since its refurbishment in 1985, it is the only English-speaking Theater in the Costa del Sol and is therefore very popular with (English-speaking) tourists. There are mostly musicals, dramas and comedies performed. At the entrance there is a cozy square with a fountain in the middle. 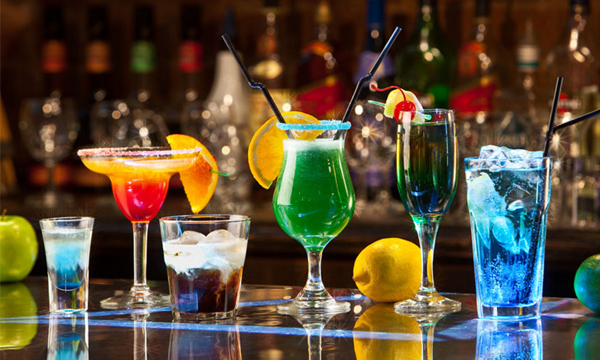 Before or after the show you can eat or drink well. The theater itself has a restaurant located in this square. A performance costs around € 15.00. They start at 20:00 on Mondays to Saturdays and at 19:00 on Sundays. The shows are often sold out early. Check out the upcoming shows with current ticket prices and available places. The Plaza de España, together with the Parque del Sol (adjacent to the zoo), is Fuengirola’s most beautiful park. It is packed with shaded cases and playgrounds. This is due to the planted (palm) trees. Due to the beautiful construction of the park, many tourists come here. Another advantage is the central location. The Museum, Bioparc, Plaza de Toros, Plaza de la Constitución and the beach are all within a 5-minute walk. In the park, a town hall square has also been processed, due to the adjacent town hall. At the park is a church not yet mentioned: Parroquia de Nuestra Señora del Carmen, a parish church. See here the services of the church. The park is open from 10:00 to 24:00, the square is always accessible.